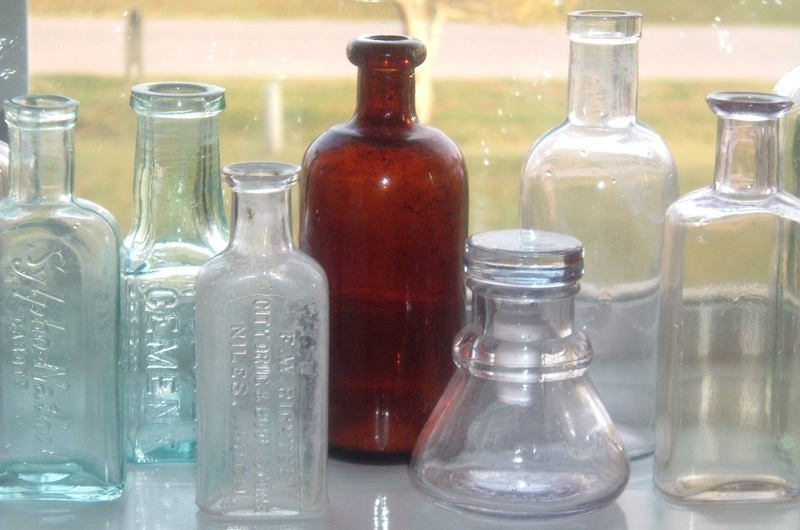 What's an old drugstore bottle got to do with ephemera, especially bibliophemera? I guess it depends on how you define ephemera. Or how much you want to stretch that definition. Webster's Third New International Dictionary (that 10-pound big boy) defines ephemeral as lasting or existing briefly. That would qualify a medicine bottle as ephemera, but I know the definition has evolved to mean printed matter. But this bottle came from a drug store that was also a bookstore. F.W. Richter ran the City Drug & Book Store in Niles, Michigan, as stated on one side of the bottle. 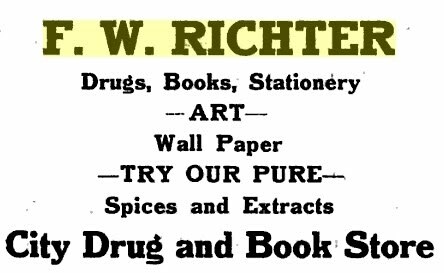 Richter is listed in an 1891 issue of the pharmacy journal, The Western Druggist,making this a relic of at least the late 19th century. My old bottle collection of some several dozen comes from a couple of summer vacations of digging around old cellar holes and dump sites in New Hampshire when I was a teenager (many years ago). The "book store bottle" is a recent addition, purchased from a Michigan dealer on the Internet. As I've never seen a bottle advertising a bookstore before, I thought I'd post about it here (lacking any other place to show it off). I have many billheads that advertise a business as "booksellers" and then go on to list all the other things they sell. I'm pretty sure these businesses were not selling second-hand or antiquarian books. Likely they were useful books to have around the home or farm--account books, how-to books, almanacs, and the like, or a few reprints of classic literature. A lot of small independent booksellers today have had to diversify to survive, mixing new retail with gifts, cards, toys, coffee, what have you. One of these days, I'll find an old billhead advertising F.W. Richter's books and other wares to go with the old bottle. 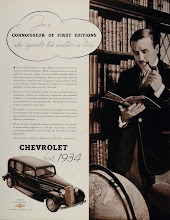 That has happened before with another company--found the glassware first and later the printed ephemera. I'll write about that one another time. 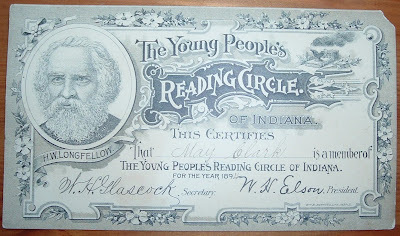 This certificate was awarded to a young Indiana schoolgirl named May Clark to confirm her membership for the year 1894 in the Young People's Reading Circle of Indiana. The ornately designed certificate sports an image of Henry Wadsworth Longfellow, inside a symbolic circle, looking as if he were monitoring the reading habits of the certificate holder. The Reading Circle's Secretary, W.H. Glascock, and President, W.H. Elson both signed the certificate. It has survived six score and more in relatively good shape, the only flaw being the nicked upper-right corner. A little research revealed an age-old concern of adults about certain media polluting the minds of the youth. I didn't realize it was that old a problem or that much of a concern in the 1800s. But one-hundred and twenty-six years ago, adults worried about young May Clark reading the wrong kind of book. That problem might be upside down today with a lot of kids--getting them to actually read a book. In 1887, Indiana school superintendents met at an association meeting to discuss, among other things, the previous four years of the Teachers' Reading Circle in the state. They reported on the program's success to the point that they thought it could be applied to the students around the state for the same kind of benefits derived from a directed reading program. "We regard the subject one of the highest importance. To place the general reading of the half million of children of the public schools under competent guidance and control, even to a limited extent, would, in our judgment, be productive of most beneficial results. To substitute for the trashy and often vicious reading matter which finds its way into the hands of children and youth a grade of literature at once sound in its contents, chaste in its language and imagery, and pure in its moral tone, is an end which may properly command the best and most earnest efforts of this Association, and of the teachers of Indiana." I wonder what kind "trashy and often vicious reading matter", impure in moral tone, those curious 1880s kids were reading? How bad could it have been in 1887? Bibliomaven might be able to shed some light on that. His specialty is children's literature from that era. I guess I'm looking at it through a 21st century prism. It's all relative, I suppose. What was shocking then would certainly be tame by our standards today. But don't we have the same arguments swirling around today about what our kids see and read and the moral decay it causes? Those teachers and superintendents in 1887 could not have even fathomed the ubiquitous violence and sexual content that young people are exposed to today from the Internet, cable/satellite television, and other media. Even the books today that do get children excited about reading might have raised the Victorian eyebrows in 1887 Indiana and elsewhere. 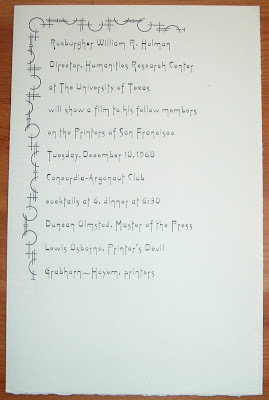 Here's a 1968 announcement card for a meeting of the Roxburghe Club in San Francisco. The featured speaker is William R. Holman, former director of the San Francisco Public Library, as well as the Harry Ransom Research Center at the University of Texas. He wore and continues to wear many other hats, i.e., printer, book designer, publisher, and writer (The Orphans' Nine Commandments). The Grabhorn-Hoyem Press designed and printed this card (5.5 x 8.5 inches), with its interesting typeface and partial border design. 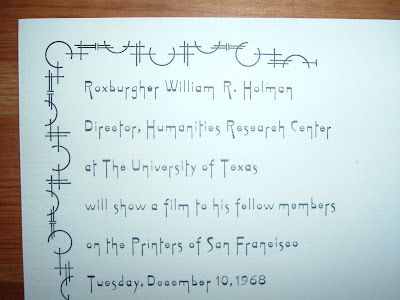 They and other printers in the San Francisco area were the subject of an 8mm film shot by Holman before he left San Francisco in 1967 for the University of Texas. The following year, 1968, he presented his film during a talk at the Roxburghe Club meeting on December 10th. Last month, I asked Mr. Holman about this piece, with respect to his film and talk at the Roxburghe Club. He said he shot the super 8mm film, describing it as "poorly made," of the Bay Area fine printers. A few months ago, he wrote a brief script for the film, both of which are now in his archives at Texas A&M University in College Station, Texas. The original, and still active, Roxburghe Club was founded in 1812 in England and is the oldest bibliophile society in the world. More than a hundred years later, an American version emerged in San Francisco, April 3, 1928 to be exact. You can read a brief history of the San Francisco club at the Online Archive of California (OAC). As it honors the original club in England by sharing the name, it also shares in the character of the original, with book collectors, booksellers, fine book printers, and bookbinders comprising its membership. These bibliophiles pursue scholarly interests and further the appreciation of fine printing and books in general. Over the years, hundreds of announcements, keepsakes, and other letterpress items have been printed by members, as typographic souvenirs and gifts for the enjoyment of the membership. 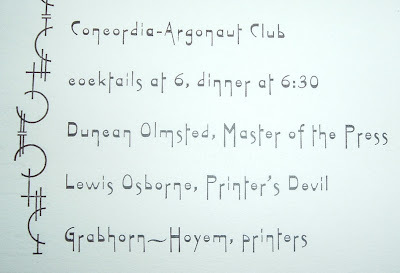 Meetings of the club have included many distinguished speakers such as Ansel Adams, Mortimer Adler, Frederic and Bertha Goudy, Alfred A. Knopf, Christopher Morley, and Lewis Mumford. This meeting announcement for the William R. Holman talk is a prime example of the kind of ephemera members produce. 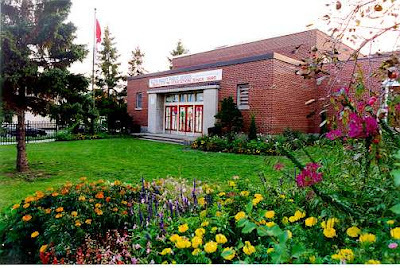 The club also publishes books. 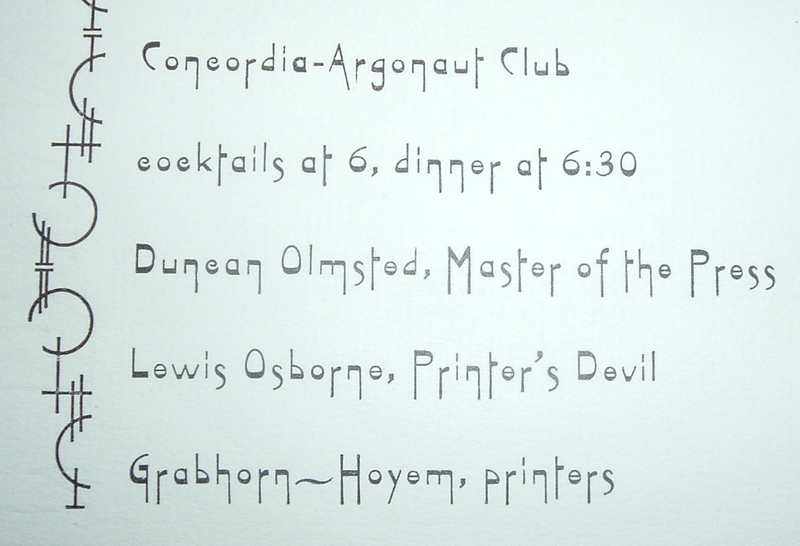 In fact, the Master of the Press (President) listed on this announcement card, Duncan Olmstead, published a book about the printed ephemera of the club: 40 Years: A Chronology of Announcements & Keepsakes. The Roxburghe Club of San Francisco 1928-1967 (1968). 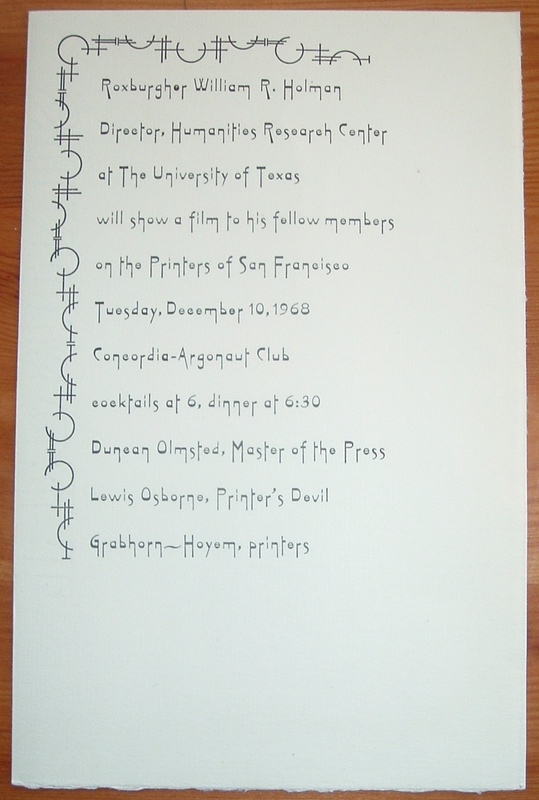 The Grabhorn-Hoyem Press (now Arion Press), which printed this announcement card, is legendary in the Bay Area and American fine printing circles. The Grabhorn Press was founded in 1919 by the Grabhorn brothers, Robert and Edwin. The Grabhorn-Hoyem partnership began in 1966 after Edwin Grabhorn died. The tradition of typographic design and fine printing continued, and after Robert Grabhorn's death in 1973, Andrew Hoyem formed the Arion Press in 1974. The genealogy of the Arion Press is recounted HERE on the Arion Press Web site with the direct ancestry of the Grabhorn Brothers and Andrew Hoyem, as well as other influential printers, typographers, and book designers who contributed to the evolution of the Bay Area's reputation and tradition for fine printing. 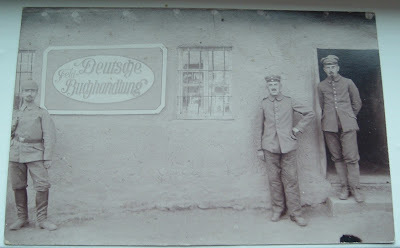 Here's an interesting post card with a scene from what looks like a German book shop at a military post during World War I. The handwritten letter on the reverse side is dated 21 May 1917 from Kanatlarci, Macedonia, which was occupied by the Germans during the Balkans Campaign of the Great War. The post card was not posted; there is neither a stamp nor a cancellation mark. Perhaps it was included with a letter or written and never sent. Regardless, the author undoubtedly never envisioned his note landing in Texas nearly a hundred years later. 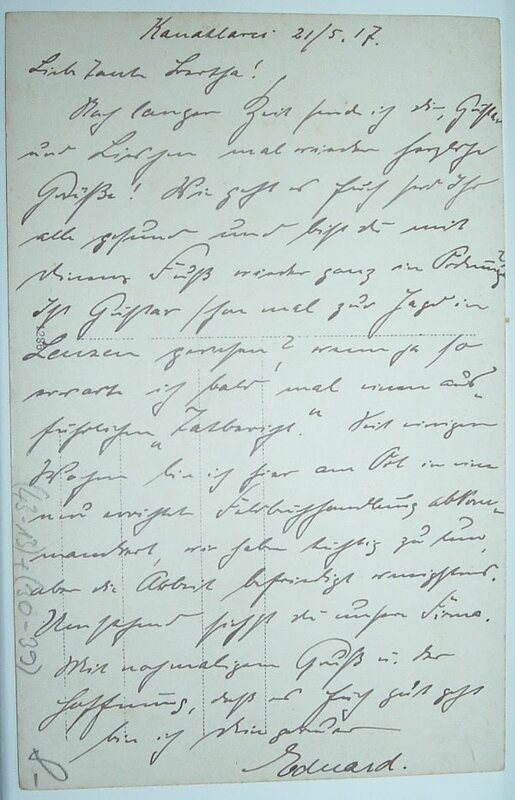 I can't make out the handwriting enough to take a stab at the German-to-English translation, but I did get Kanatlarci and the date, which told me World War I. A little research confirmed that quickly. The sign in the picture, plus the books in the window, confirm we're looking at some kind of book shop. 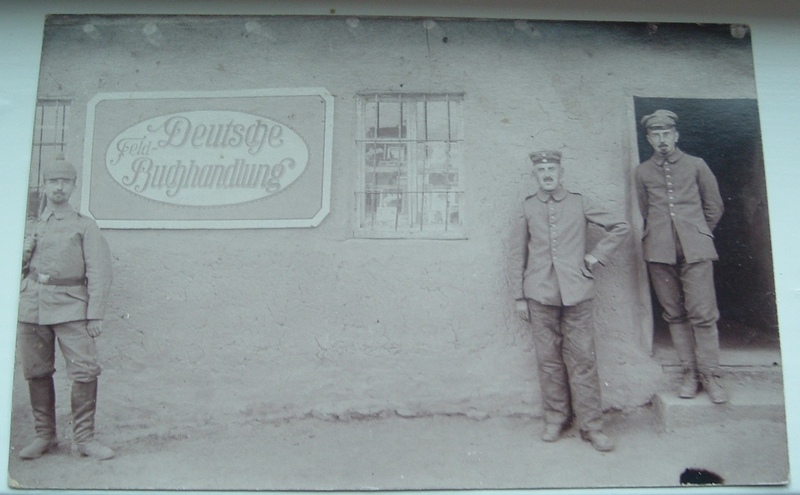 The sign reads, Feld-Deutsche Buchhandlung, which translates, I believe, to Field German book shop. But what kind of book shop? I interpret this to be book shop set up in "the field," i.e., a military post during wartime occupation of a foreign country. I thought at first this might be for the troops, to provide them with something from home. Literature from German authors in the German language. I rejected that later because, well, why not a library to fill that need? They wouldn't make the soldiers buy the books. And if the building housed a library for the troops, the sign would read Bibliothek instead of Buchhandlung. Perhaps this book shop was for the citizens (and military) in Kanatlarci to buy and read German propaganda, to learn about the conqueror's culture and history. I just don't know. This did get me to thinking about other wars and if similar stores were set up by armed forces in occupied lands. Starting with Iraq and Afghanistan and working back in time, I couldn't find a single instance of a similar occurrence. That doesn't mean there weren't any, but I'm just not finding them if they exist. I spent a few hours searching from various angles with a variety of keyword combinations. Nothing like the Feld-Deutsche Buchhandlung turned up. I'll keep researching because I'm interested in how books or a book shop figured into the strategy of a military campaign or for the operations of a military post in a foreign country. There was clearly a purpose for this book shop. Perhaps a reader will see this who can shed some light on the subject. 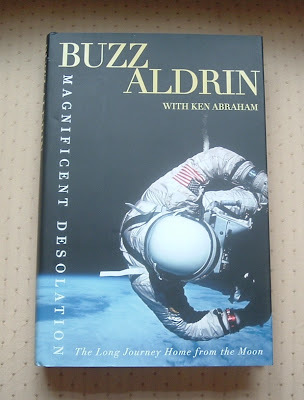 In honor of 80-years-young Buzz Aldrin's appearance on the new season of Dancing with the Stars (debut tonight), here's a piece I posted back in July of last year. 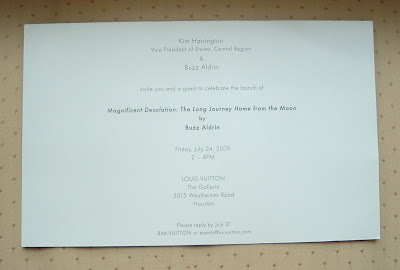 It's an announcement card for his appearance at a Houston store to sign his latest book, Magnificent Desolation. The card is from the Louis Vuitton Core Values Ad Campaign, photography by Annie Leibovitz. 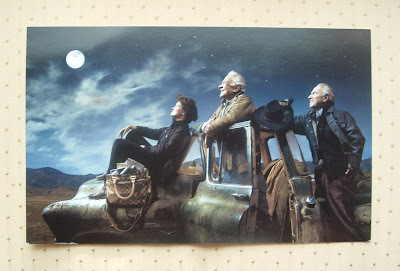 The announcement is printed with the Leibovitz photo of Sally Ride (first American woman in space), Buzz Aldrin, and Jim Lovell (ill-fated Apollo 13). The photo is on thick cardboard stock, measuring 14.7 by 23.5 cm (5.75 by 9.25 inches) and contains the printed announcement on the back. As Buzz Aldrin walked on the moon on that historic first trip in 1969 (Apollo 11), here's an historic film (apparently the first science-fiction film) about a trip to the moon: Le Voyage dans la Lune. It was directed by George Melies in 1902 (yes, 1902!). It's in two parts, but Part 2 appears first below. This part begins with the actual landing on the moon and the adventure that ensues. The silent movie (narration added in 2006) explores the fantasy of a trip to the moon. You can see Part 1 (prep for the trip) here. The visual effects are quite remarkable and innovative for the times. 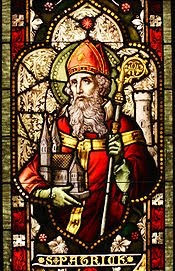 I couldn't let St. Patrick's Day slip by without a quick post related to Ireland. But I did let it slip by. Try as I might, I just couldn't find the piece I wanted to post about until late in the day. So I actually got this started on the 17th, as it is dated, but the luck of the Irish wasn't with me in getting it finished. And I do have Irish blood, which goes back to County Armagh. 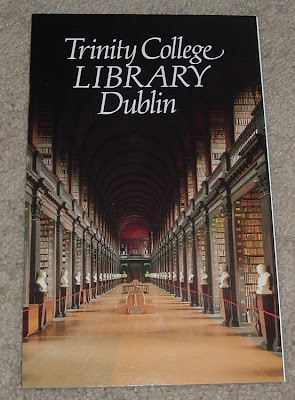 I hadn't looked at this booklet about Ireland's Trinity College Library since returning from a European trip some 16 years ago, which is why I had a hard time finding it. On that trip we got to spend a day in Dublin and toured the library. 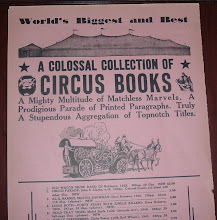 This booklet was a souvenir purchased at the library's gift shop, one I'm glad I got and kept (well-hidden!). 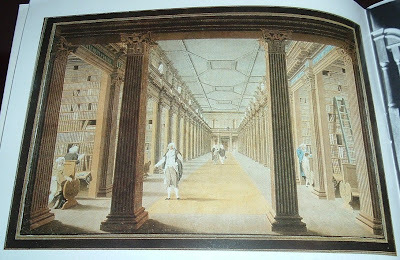 I remember seeing the Long Room, shown on the cover of the booklet, and being completely awed by the splendor, its architectural history, and the books. Oh, the books! The Long Room is also depicted in an 18th-century painting by James Malton, which is reproduced in this booklet. The booklet's rear cover features an enlarged section of the painting. The highlight of the tour, of course, was the Book of Kells, for which I have another souvenir booklet. The Book of Kells is an illuminated manuscript written about the year AD 800 in a monastery scriptorium, but various artistic traits of the manuscript make it difficult to say exactly where it was produced. The Four Gospels of the New Testament comprise the manuscript of 340 calf-skin leaves and it is illuminated with beautiful art work throughout. Even the Latin text displays ornate decoration between many of the lines. Indeed, only two pages in the entire manuscript are without color. I had a video camera and a 35mm camera, but was not allowed to shoot from either, as I recall. So I'm glad I got the booklets to remember a bit of what I saw. 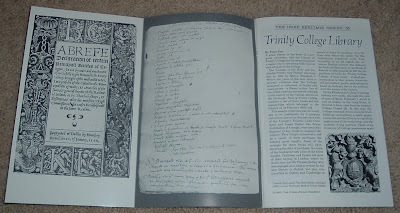 The Trinity College Library booklet was written by librarian Peter Fox. 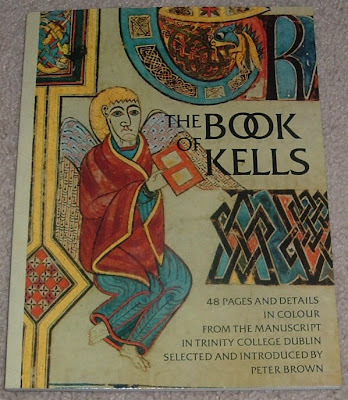 The Book of Kells booklet was written by historian Peter Brown. There are too many beautiful images, as well as much history, to pick and choose for inclusion here. I fear this post would get too bloated with information and detail, so I've tried to provide appropriate links that will furnish more information as a reader's interest may desire. Later that day, after touring the library, we followed the sound of Irish music coming from a live band in a music shop near downtown and enjoyed an unplanned concert. And we worked up a powerful thirst that was quenched by a pint of Guinness (or two) in a nearby pub. History, rare manuscripts and books, Celtic music, and an Irish pub--all in Dublin. That's what I was remembering on St. Patrick's Day yesterday. So Happy Belated St. Patrick's Day! 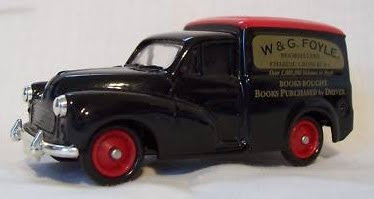 Here is a Foyles bookmark, complemented by a model of a van the bookstore used (or may have used) long ago to transport inventory to and from its shop. Foyles was founded in 1903 by the Foyle brothers and today they are still independently owned. But they've branched out from the flagship location on Charing Cross Road, a London street known for its booksellers and put in the spotlight in Helene Hanff's 84 Charing Cross Road. Penny Mountain and Christopher Foyle authored a history of the book store in 2003 to celebrate a century of business: Foyles: A Celebration. I've had the bookmark for awhile now, but the model van is a recent purchase thanks to an unintended search result on ebay. It reminded me of the old Matchbox Cars I collected as a kid. And like the Matchbox Cars, the Foyles van was made in England. This model is Issue 25, a Morris Minor Van in the Days-Gone line made by Lledo, a company co-founded in 1982 by the former president of Matchbox, coincidentally. That explains why I was reminded of the cars I collected in the 1960s. Though not ephemeral by design, I thought the bookseller's van complemented the bookmark and had to add it to my collection. Things that readers leave behind in their books are referred to as flyaways. Sometimes these things are used as bookmarks, sometimes the book is just a convenient place to stash something for safekeeping. Now where did I put that twenty dollar bill? I've never found money between the pages of a book. I usually find the more typical ephemera like scraps of paper, deposit slips, receipts, envelopes, and gum wrappers. But I've also found autographed baseball cards, long newsy letters, utility bills, airline tickets, and photos. See thingsinbooks.com for more examples of the interesting, unusual, and downright strange flyaways that people find in their books. The most interesting (or perhaps most touching) thing I ever found was a small collection of Valentine cards and notes from two little girls to their father, penned about 1960. I found them several years ago and thought they must have been put in the book for safekeeping and were long forgotten. I decided somebody should get these back. Some quick research revealed the father was deceased, but one of the girls turned out to be author (A Return to Love) and lecturer (A Course in Miracles), Marianne Williamson. I was able to find an email address for her and we corresponded about the items, which she, of course, wanted to have, as both her father and sister had passed away. So some 45 years later they found their way back one of the sisters. Getting back to the flyaways that prompted this post... Bibliophemera is not the usual find, surprisingly, but yesterday, I hit a trifecta of flyaways that relate to those things biblio. Cataloging books, I found a 1950s bookstore announcement card, a 1980s author promotional photo post card, and a 1940s-50s bookmark. First up is the Witkower's bookmark, Witkower's having once been the name of a Hartford, Connecticut book store with a long history through several owners and name changes. A 1992 Hartford Courant article, by Jocelyn McClurg, Courant Book Editor, provided the history behind Witkower's Book Store, Israel Witkower having been but one owner in the long genealogy of that store, whose patronage included President Lincoln and Mark Twain. The city's oldest bookstore has a colorful history and a complicated lineage. The business was launched in 1835 when Caleb M. Packard and Flavius A. Brown began selling books in a store lit by whale oil lamps at 20 State St. 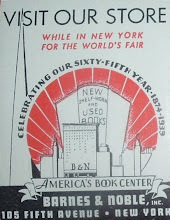 When it opened, Packard & Brown's was one of seven bookstores in the city. In 1935, a Courant article said that no inventory existed of the store's original stock, but "doubtless religious books headed the list. "Partners came and went, and the store evolved into Brown & Parsons in 1838, Flavius A. Brown's in 1852 and Brown & Gross in 1858. In 1846 the business moved to the southwest corner of Main and Asylum streets, where it remained until 1869. 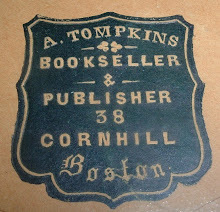 The store then moved to 77 Asylum St., which took weeks as thousands of books were carted up the street in wheelbarrows. In March 1860, Abraham Lincoln, on a campaign swing through the state, stopped in Brown & Gross, where he and Gideon Welles of Glastonbury -- the future secretary of the Navy -- talked politics. Brown & Gross lasted 33 years and attracted such famous customers as Mark Twain, who spent nights in a back room in the bookstore telling ribald stories, and Harriet Beecher Stowe, who sat in a chair and had books brought out for her perusal. In 1891, when Gross died, the store's name changed to Belknap and Warfield's, for Leverett Belknap and George F. Warfield, who had joined Brown and Gross as partners. From 1910 to 1929 the store was called G.F. Warfield & Co.
Israel Witkower, who became a partner in 1920, assumed ownership when Garfield retired in 1929, and the store was called Witkower's for more than three decades. In 1960, Witkower's was acquired by Trumbull Huntington, a Middletown publishing executive. Huntington also bought Witkower's West Hartford branch (long since closed) and renamed it Huntington's as well, which is why the telephone book lists Huntington's as Huntington's Book Stores. In 1965 Huntington's moved to 110 Asylum St., and eight years later it moved to its present location at 65 Asylum. Isaac Epstein worked for Huntington and bought the downtown business in 1979. After Isaac Epstein died in 1988, his son David took over. A year after this article was written, the succession of book stores ended for good as Huntington's closed its doors in 1993, a victim of the economy and the big chain booksellers that had moved in nearby. 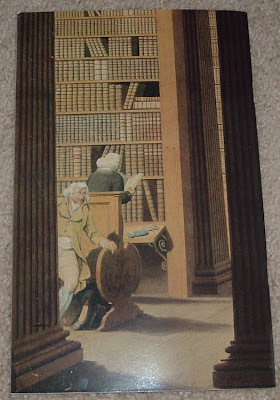 Next up is an announcement card from a long-defunct Houston book store called Books, Inc. 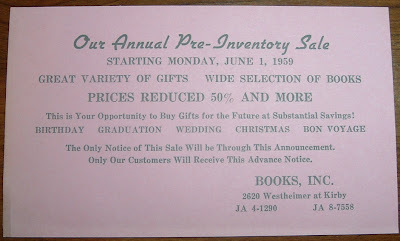 The 1959 card announces an upcoming annual pre-inventory sale. I have little else on the history of the shop, other than it resided on Westheimer at Kirby (for anyone familiar with Houston). I never went in there, that I can remember. Sam Williamson, whose book held the Valentines and notes mentioned earlier, may have bought some of his books there. He was a local attorney and well-read by all appearances. A chunk of his library comprised a large load of books I bought in 2003, but I don't recall coming across any Books, Inc. shop labels affixed to any of Williamson's books. The store was still viable as a book store in 1982, according to an advertisement I found from that year, but nothing resembling a book store exists in that location today. 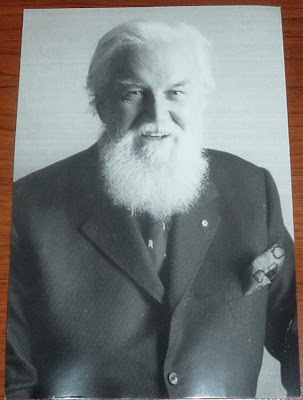 The last item I found yesterday, stashed between the leaves of a book, is this photo postcard of author Robertson Davies. 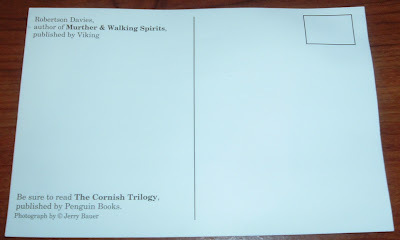 The back of the card promotes the Canadian writer as the author of Murther & Walking Spirits and of The Cornish Trilogy. Speaking of which, Davies authored a trilogy of trilogies: The Deptford Trilogy, the aforementioned Cornish Trilogy, and The Salterton Trilogy. That's it for the flyaways. Most things I find are not related to bookish matters or historically significant, and they have little or no interest to me. Those flyaways become filed away, as in the trash can. The old label you sometimes find pasted inside the cover of an antiquarian book is not always an ex libris, at least not the typical ownership bookplate we've become accustomed to. This label was printed in 1896 and affixed to the following book for an award presentation to an accomplished young man in grade school. 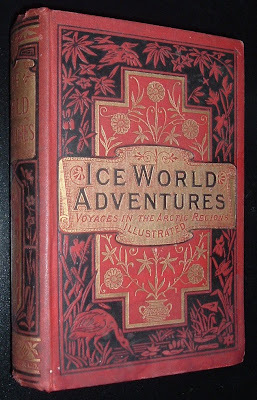 Ice-World Adventures, Or, Voyages and Travels in the Arctic Regions: From the Discovery of Iceland to the English Expedition of 1875 was published by Ward, Lock, and Co. in London, circa 1876, but I'll bet even this second-hand book of some twenty years, with its ornate decorations and many engravings of Arctic adventure, was still an eye-popping prize for the young man. It would have been for me (as it was when I found it some years ago at the "young" age of 40, about 350 miles across the border in a New Hampshire village book shop). 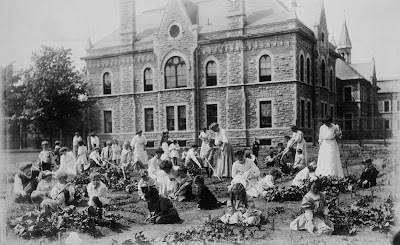 Charles Walliss attended the Elgin Street (Central) School in Ottawa, Ontario in the 1890s. He appears to have been awarded this book for not one, but three accomplishments: 2nd prize for promotion (whatever that was), 1st prize for class marks, and a special prize for spelling. 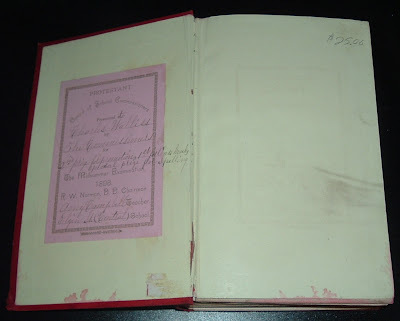 The accomplishments were so many that the writing went off the bookplate and on the book's front endpaper! 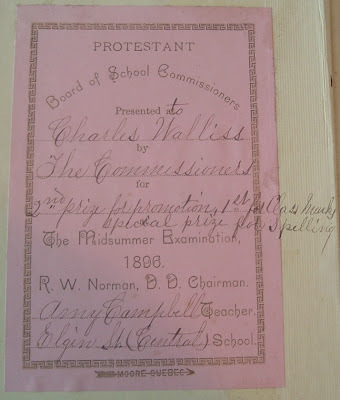 Some items of interest to note on the label: Young Charles achieved these honors at the Midsummer Examination in 1896. Sounds like the school year went through the summer. I wonder if the schedule was altered because of harsh winters, when attendance would have been difficult? Also, the promotion prize doesn't sound like promotion to the next grade level. How does one come in second for being promoted? You're either promoted or you're not, right? So I'm not sure what the promotion was. And last, the designer/printer of the bookplate appears to be Moore of Quebec. Without launching a research project into the printing trades of Quebec during the time, I just found it curious that a local Ottawa business didn't provide the bookplate. Surely, a city of Ottawa's size in 1896 had a few printer's to choose from. The Protestant Board of School Commissioners, chaired by R.W. Norman, D.D., awarded the book to Charles. The award presentation plate was signed by his teacher, Amy Campbell. 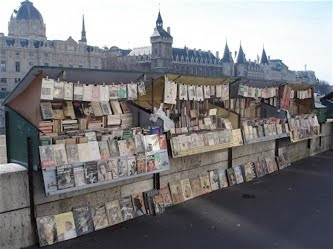 To stroll along the Left Bank close to Notre Dame cathedral used to be to promenade, simultaneously, through one of the most beautiful of all cityscapes and the biggest open-air bookshop in the world. 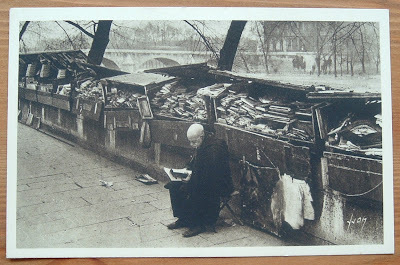 The little book stalls – 235 of them, on both sides of the river – are still there. Some of them remain purely, or largely, bookshops, specialising in old tomes on the cinema, or science, or military history, or the works of Jules Verne. Others have become almost indistinguishable from souvenir stalls, festooned with posters of typical Parisian views in untypical colours or garish reproductions of early 20th-century, metal advertisements for cures for chillblains. After years of neglecting the growing difficulties of the bouquinistes, the Paris Town Hall, which owns the spaces and lets them free of charge, has decided to clamp down. Over 40 stall-holders have received registered letters in recent weeks. If they do not obey the rules – which prescribe that at least 75 per cent of their stock must be books, old magazines or fine engravings, and that no more than 25 per cent may be tat – they risk being thrown off the quays by April. The warning has forced some stall-holders to switch rapidly, and reluctantly, back to books. It has also revealed deep divisions, and jealousies, within the ranks of the bouquinistes themselves. I was there briefly--touring the Notre Dame Cathedral, cruising the Seine on a Baton Mouche--but I somehow missed the bouquinistes. A tight schedule, no doubt, but I kick myself now for not having wandered over to check them out. That was 15 years ago and I haven't been back. Some day. And I hope the booksellers will have won out. It would be no fun to stroll down the Left Bank and rummage through a bunch of souvenir trinkets--something I just wouldn't do anyway. From the looks of the photo post card I have above, it would be more like dumpster diving. If it's for books and vintage ephemera, though, I'm game. I've sifted through worse looking piles than those. And without the adjacent scenery. That's a tough one to beat! I found this label for the Anthony Newnham Collection of Evelyn Waugh mixed in with a batch of William D. Wittliff items I bought last month. I'm not sure yet what it was doing hanging out with the Wittliff ephemera, nor do I know of any relationship this collection or label may have with Bill Wittliff. I suspect, though, that he designed the label. The label indicates a library collection, measures one inch by two, and was likely a prototype or copy of the design already in use. 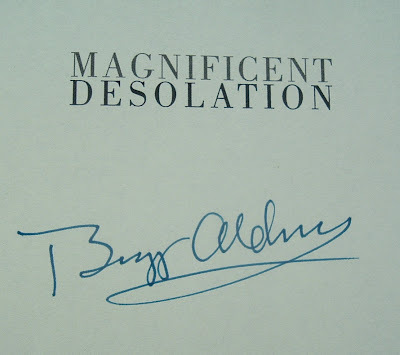 Its simple, tasteful design features a facsimile signature of Evelyn Waugh, and the abbreviated Colln., with the "n" in superscript. This collection resides in the Harry Ransom Center at the University of Texas in Austin where Wittliff ran his Encino Press. Depending on the year of the donation, this might add support to the assumption of a Wittliff design. Manuscripts of all of Waugh's novels (except for two), much correspondence, and the entire contents of Waugh's personal library, including some of the furniture and works of art, arrived in Austin in 1967. The Ransom Center's collection of Waugh first editions was completed in 2006 with the addition of his suppressed pamphlet An Open Letter to His Eminence the Cardinal Archbishop of Westminster (1933), thought to exist in only a single copy. The Anthony Newnham collection of Waugh provides an additional layer of bibliographical depth. I can't find any specifics on Newnham's donation, but it very likely consisted of first edition books. Newnham was a well-known and respected bookman on both sides of the Atlantic Ocean. Anthony Newnham tended mainly to marry against type. His first wife, I am told, was a proper English housewife -- thus, in America, he usually went for wild, drug-taking motorcycle girls.... He was a very attractive man, even though, for a time, he had no front teeth, these having been knocked out by a cricket ball when he was nine. He lost his bridge and, for some years, didn't bother to replace it.... All along he kept on marrying and siring children he could not support. Finally he went back to England, a child-support fugitive.... He fell dead, I'm told, while lifting a wineglass to his lips -- an ideal exit, all things considered. For the first of March, I'm resurrecting, in altered form, a piece I wrote for Archaeolibris three years ago today, titled Burning books... and the bookseller: Papal persecution of the Waldenses. It centers on the history behind an image on an engraved plate separated at some point in time from the book in which it was originally published in 1770. As this engraving has likely been flying solo for awhile and stands on its own just fine, I'll qualify it as a piece of ephemera suitable for the scope of this blog. I have here an antique engraving from 1770 that depicts a bookseller being burnt at the stake in Avignon. His crime was selling Protestant Bibles, reportedly printed in the native French tongue of his customers. The engraved plate came from Henry Southwell's, The New Book of Martyrs or Compleat Christian Martyrology, published in London by J. Cooke in 1770. I wanted to know who the bookseller was and why selling certain books cost him his life. 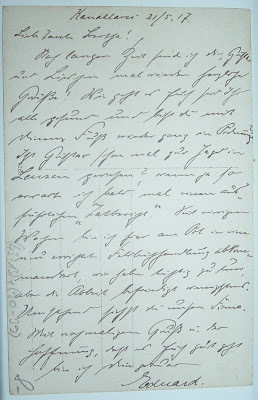 I had a similar curiosity about a German bookseller named Johann Palm, who was executed by Napoleon's troops, and researched some pretty fascinating history that resulted in the very first entry on the Archaeolibris blog in 2006. So here I have another martyred bookseller in my collection. I knew from the engraving that it happened sometime before 1770 in Avignon, France, and the bookseller was selling French language Bibles. I also knew I was in for more research to learn more about this poor fellow. My search led me to the Waldenses of France, a Protestant sect that broke from the teachings of the Church of Rome and suffered brutal persecution for hundreds of years. Providing some very brief background details, a certain Pierre Valdo became a thorn in the Pope's side sometime around 1150 A.D., preaching a reformed Christianity that supported separation from the Catholic Church. His followers became known as the Vaudois (Waldens), with most of their parishes being in the Alpine valley of the Piedmont. Their numbers reached about 20,000 and missionaries went forth to spread the word. Despite the documented history, I can find no record of a bookseller being burned at the stake in Avignon. However, a rather well-documented case of another bookseller’s demise, for the same crime no less as the that of the bookseller in Avignon, does exist about the same time in Turin, Italy. This bookseller was Bartholomew Hector, a native of Poiters in France. After his own break from the Church of Rome to embrace the Protestant faith, Hector had settled in Genoa to live peacefully with his family, practicing his new faith. He began selling Bibles and his journeys took him into the Piedmonts to sell French language Bibles to the Waldenses. On one such trip, he was captured by Roman soldiers and jailed for nearly seven months before being brought to trial for the crime of selling French language Bibles to Protestants. To this faithful Christian man this last offer was but old temptation under a new form. It was in his eyes an absolute recantation of his Faith, an actual betrayed of the Savior who had died for him. This was no time for unholy compromises. Instead of returning an answer to the messenger of the court, he fell on his knees on the pile on which He was to die, and clasping his hands and raising his eyes to heaven, he exclaimed in a loud voice: "O Lord! Give me Grace to preserve unto the end; pardon those whose sentence is now to separate my soul from my body; they are not Unjust, but Blind. O Lord! Enlighten by Thy Spirit this people who are around me, and bring them very soon to a knowledge of the TRUTH." At these words the people, who had waited in a painful suspense, to see how the martyr would receive the offer of pardon, burst into a loud sob, and there were some who cried out that it was a shame to put to death so good man who gave such evidence of being a Christian. The officers, fearful of the effect of this feeling, ordered the execution to put his victim to death without delay. The martyr was seized, thrown down upon the pile and strangled, and at the same moment the flames shot up enveloping the stake and the victim from the gaze of the multitude. The soul of Hector had passed through eternity into New Jerusalem, to receive its reward from the hands of Him who has said: "To him that overcometh Will I grant to sit with me in my throne, even as I also overcame, and sit down with my Father in His throne. Quite a story of unwavering faith. But this is just one of thousands if not millions during several hundred years the Waldenses resisted the Church of Rome. It is very likely there was more than one bookseller selling French Protestant Bibles. It is equally likely that more than one could have been caught and burned at the stake. But the way in which Bartholomew Hector moved the people who had gathered to watch him burn distinguishes him from others. Bartholomew Hector is the only “burnt bookseller” I know of from Foxe, Southwell, and others editions of the Book of Martyrs. 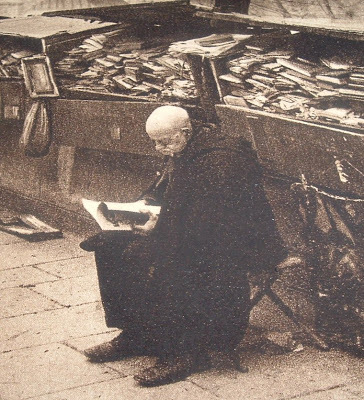 Is it possible that the French Protestant bookseller depicted by artist Dodd delin in Southwell’s book was actually executed in Turin? It stands to reason that if you’re going to depict a bookseller burning at the stake, your likely subject will be the bookseller well documented in the book in which your engraving will appear. Until I find out otherwise, if I do, I will entertain the idea of a factual error in the engraving's caption.